Plan that are active today include bottomfish, crustacean and coral reef fish. waters; however, available habitat is limited because of the steep topography. precious coral harvests have occurred within EEZ waters around the CNMI. limited to one day and within a 30-mile radius. In CNMI, fishermen target red-gilled emperor. About 150 skiffs fish the islands and banks from Rota to Zealandia Bank north of Sariguan. About 8 to 43 larger vessels ranging 29 to 70 feet make multiday trips to the Northern Islands, focusing effort from Esmeralda Bank to Zealandia. In Guam, fishermen target reef-dwelling snappers, groupers and jacks. Less than 20% ofthe harvest is outside 3 miles, and charter fishing accounts for about 15% to 20% of all bottomfishing trips. Three commercial bottomfish vessels are believed to be active. for the US EEZ of the Mariana Archipelago. and non-commercial catch could double this figure. around Saipan and Tinian, in the 1990s. Recent information on noncommercial catches of coral reef resources is not available. In CNMI, most fishing is in near-shore areas. Finfish and invertebrates are the primary targets. Small quantities of seaweed are taken. 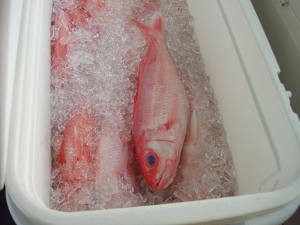 Commercial landings include parrotfish, surgeonfish and goatfish. Six of the Northern Islands have been fished commercially. Currently moratoriums exist for sea cucumber and topshell. 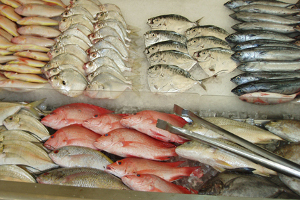 In Guam, primarilyshore-based fishermen harvest more than 100 species of fish. Less than 20% of the coral reef resources harvested is taken in the EEZ. Most offshore banks are deep, remote, shark infested, subject to strong currents and accessible only from May to September.